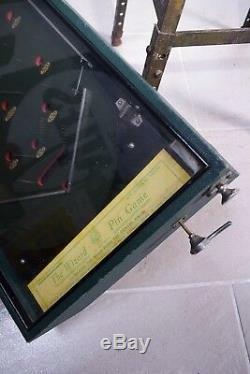 A superb table top pinball machine. Although we are unsure of the actual age of this piece, we believe it would date to the earlier part of the 20th century, circa 1920s. 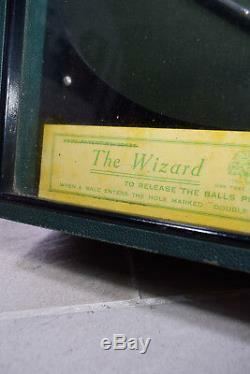 The Wizard, made by The School Automatics Ltd, of Harlesden, London, this particular piece is offered in working order. 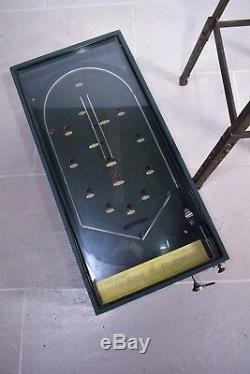 Made with a wooden frame, the game has a glass fascia and is finished in a Green pattern. 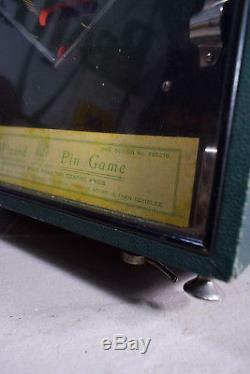 The game has two balls inside, yet not being experts by any means in this field, we are unsure if the game is complete, or of course in a full working condition. Simply pull back the metal handle, turn it to the right and this releases the balls. 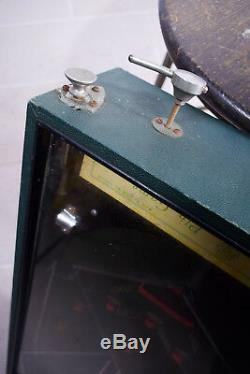 Then like most pinball machines, pull back the metal lever to propel the balls up and around the playing board. Again, weve been able to play this quite effectively, yet we are not sure if to the collector or enthusiast is complete On that note, please feel free to ask us questions. We are offering this piece in as found condition, therefore there is some natural wear and tear. There is a weathered finish in general, with surface scars and abrasions, paint chipping and some tatty wood areas around the frame. Structurally the piece is in good shape, albeit its a little little tatty and dirty in places. We feel this simply adds to the charm and authenticity of this piece in its current form. Please do study the photos to help with your analysis as it would be hard to highlight all imperfections. Dimensions : Depth : 67.5cm, Width : 30.5cm, Height : 15.5cm. Condition : Structurally good, some surface marks and scratches, some paint chipping, a little tatty in areas, dirty in places, some chips and some small losses to the wooden frame, rusty in areas, working order but not checked for completeness. You can view this product in our Ralph & Co.
Showroom in Burwell, Cambridgeshire, CB25 0AA. Do check our superb feedback! If you need your order sooner, then please do get in touch - we will certainly try and help you with your deadline. If you live in a postcode that is not classified as mainland UK, please get in touch prior to purchasing as there will be an additional cost. You will be asked to sign an additional receipt to confirm that you have collected your item. We pride ourselves on the quality of our products and services, therefore if we ever fall short of your expectations please get in contact. If you have changed your mind and you no longer want the product you ordered, you have 14 days to return the item to our head quarters. For any of the above, please notify us of your intention to return your product(s) via telephone or personal meesage within 14 days of purchasing. We appreciate you viewing and considering our item, thank you.. 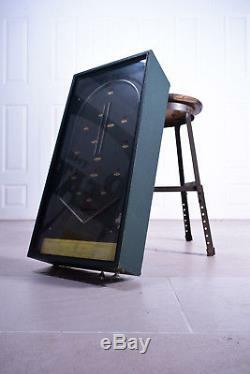 The item "Antique 1920s The Wizard Table Top Pinball Game Machine Working Order Arcade" is in sale since Sunday, March 17, 2019. 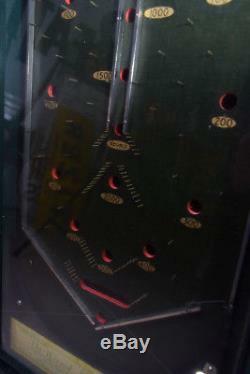 This item is in the category "Video Games & Consoles\Coin-Operated Gaming\Pinball Machines". 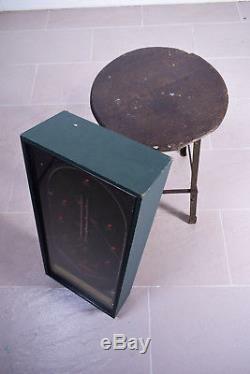 The seller is "ralph_and_co_antiques" and is located in Soham/Ely, Cambridgeshire. This item can be shipped to United Kingdom.